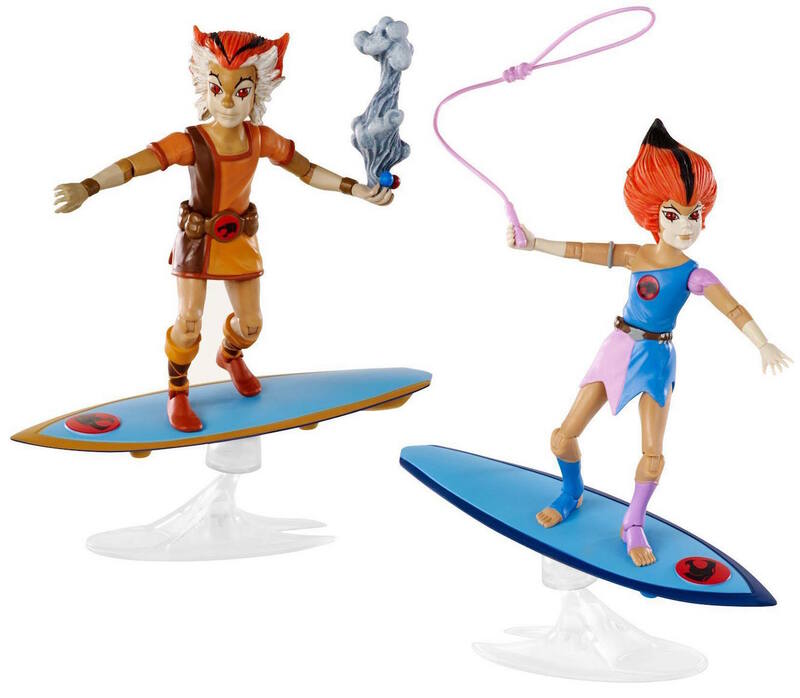 At the 2015 San Diego Comic Convention (SDCC) Mattel surprised everyone by anouncing that they picked up the ThunderCats license and a series of figures, based on the classic cartoon, was being planned! 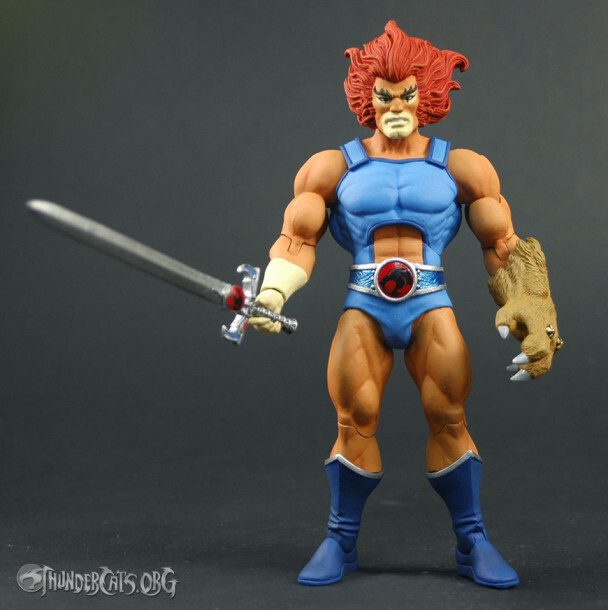 The figures came to fans in late 2016 in a subscription called Club Third Earth! 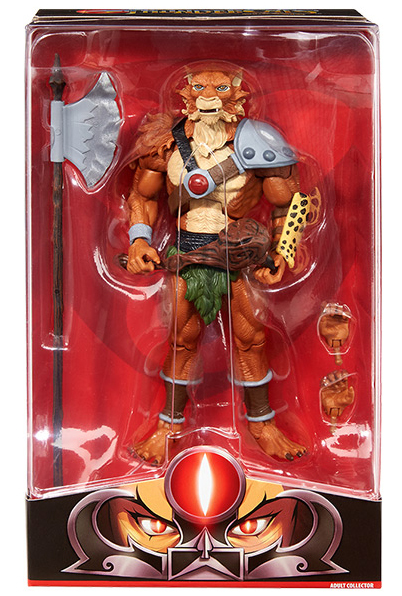 Unfortunatly, with the end of MattyCollector came the end of the ThunderCats Classic line. 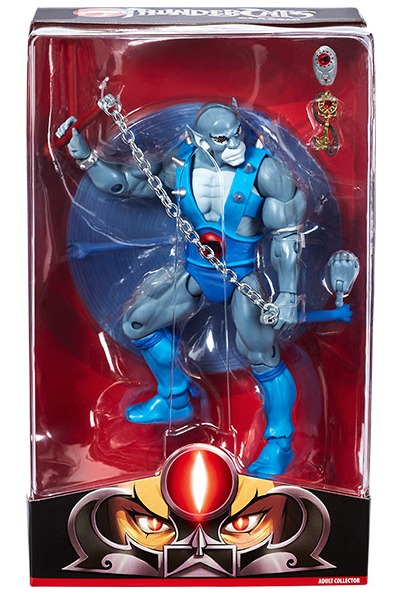 December of 2016 saw the release of the last subscription figure; Panthro. If and when this line is continued by another company or yet another line is started is uncertain. 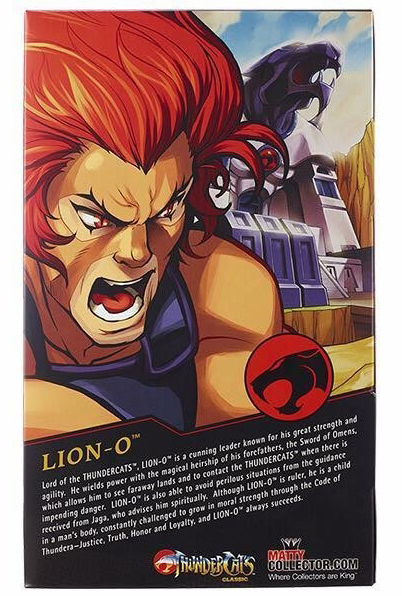 But after the 80’s LJN line, BanDai’s ThunderCats Classics and Mattels ThunderCats Classic line, the Cats have 6 lives left so it would’nt be a surprise. 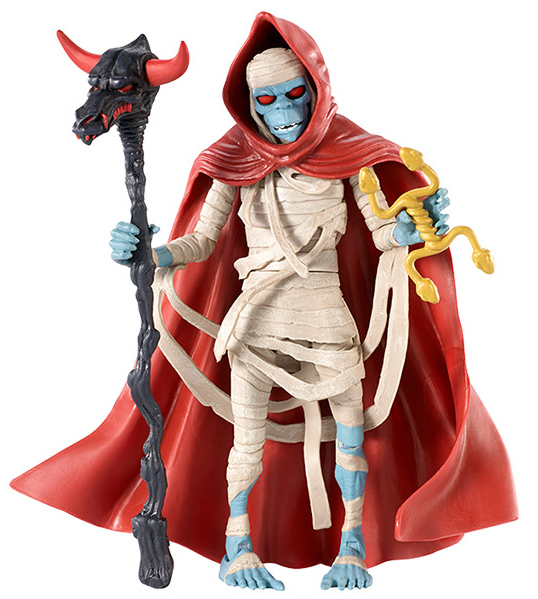 This beautiful figure was the Sub-exclusive figure, available only to subscribers of 2016 Club Third Earth as a benefit of membership. 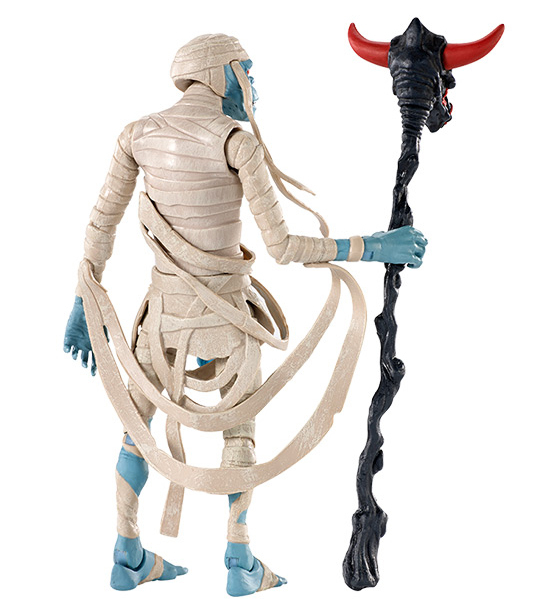 Mum-Ra is a fully-articulated, 6” figure. 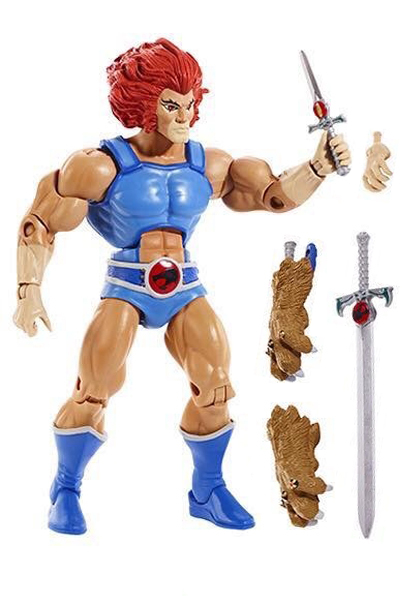 He comes with an extra set of hands, two hooded cloaks; one open and one draped closed, Sword of Plun-Darr (handle), and Staff which is an updated version of the vintage LJN Mail-In Mumm-Ra’s staff..
As is tradition, the first release in this line is The Lord Of The ThunDerCats himself: Lion-O! 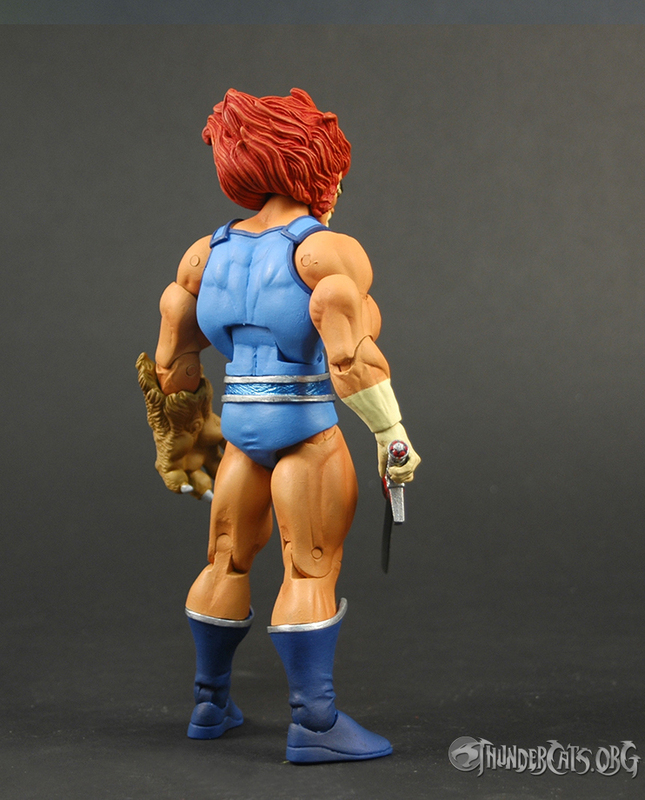 What fans had been asking for became plastic reality; ThunderCats figures utilizing the body type, or “buck”, of MATTEL’s populair Masters Of The Universe Classics line. 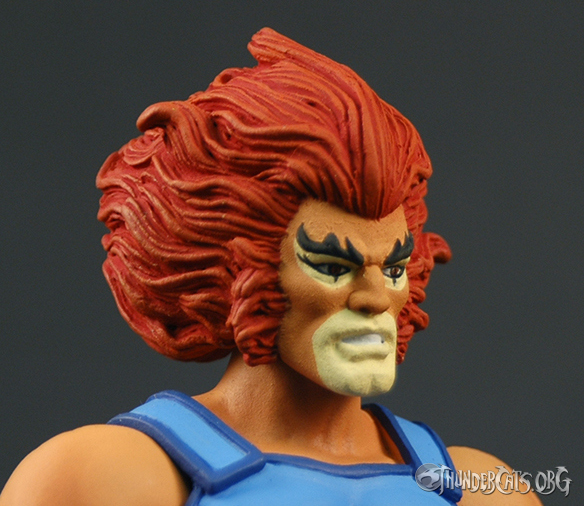 The Four Horsemen did a great job creating that classic look with modern day artuculation and detailing. 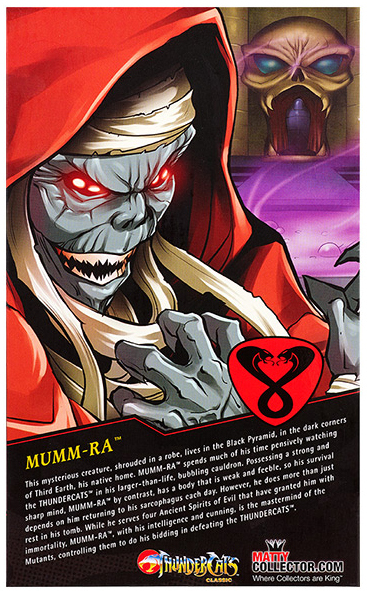 The figure stands approx. 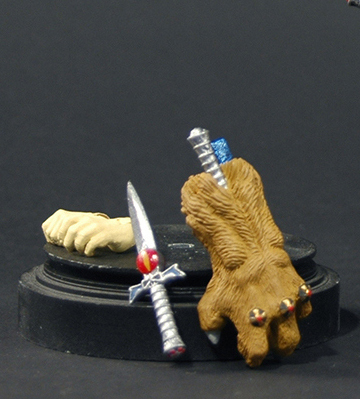 6 ” tall and comes armed with The Sword Of Omens, both dagger and full size, two Caw Shields, one to wear and one with the Sword stored in it. 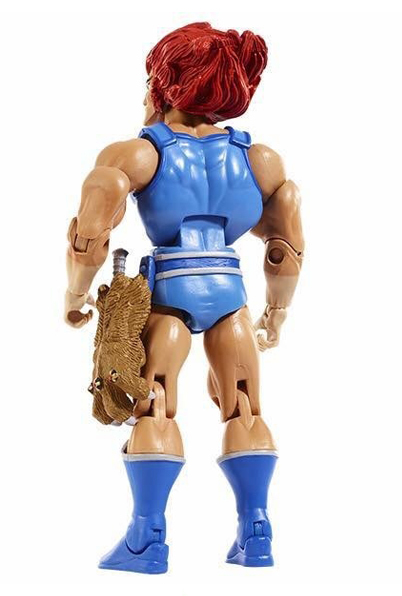 For some reason he also comes with an extra set of hands. While generous, the right hands are so similair there is no need for two. 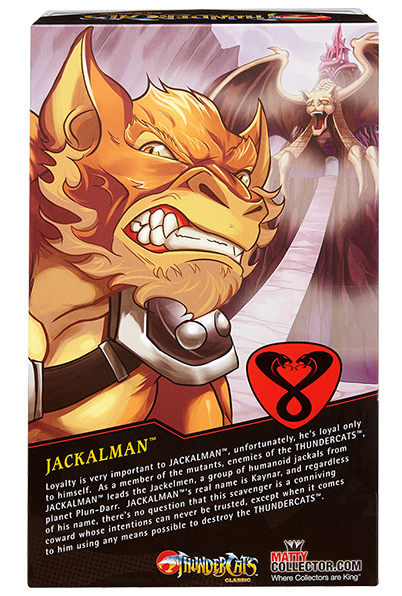 October 2016 saw the release of everyone’s favorite cowardly dog; Jackalman! 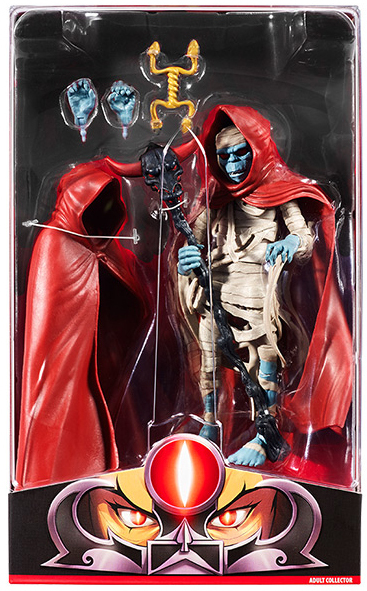 The Four Horsemen did a great job creating that classic cartoon look with modern day artuculation and detailing. The figure stands approx. 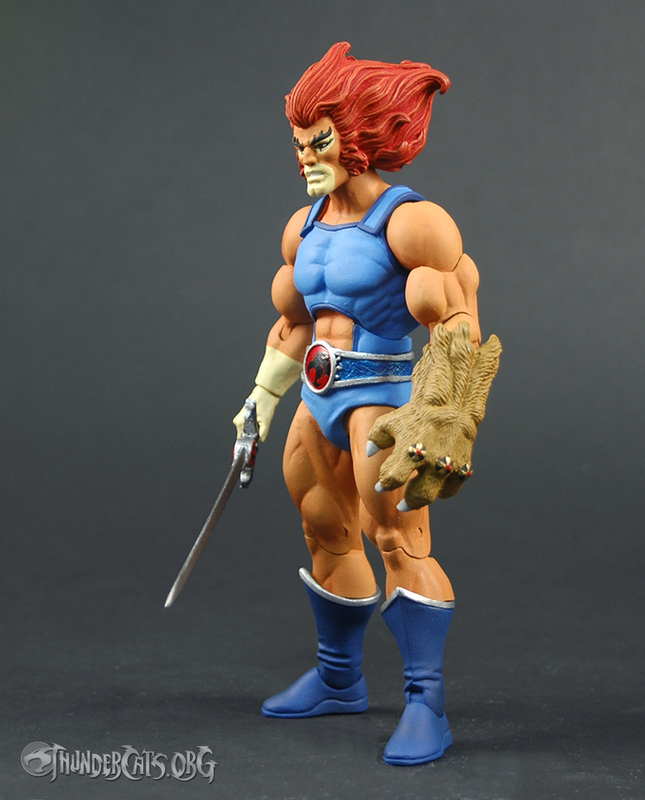 6 ” tall and features an extra set of hands and removable armor. 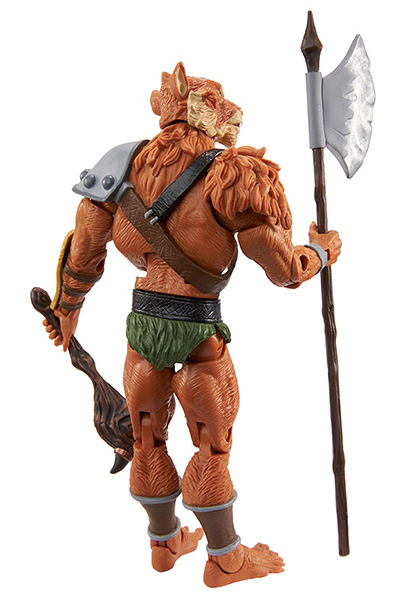 He comes armed with an axe that -according to his bio- belongs to the evil Slithe and a very vintage inspired club. Late November 2016 marked the release of the first -and only- adult female of the line. 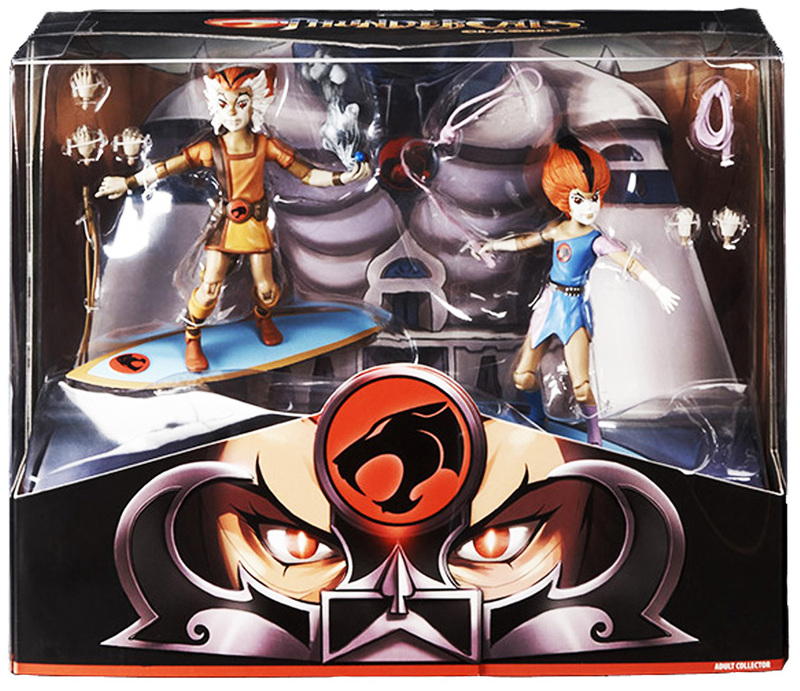 Pumyra adds some Season 2/ New ThunderCats flavour to toy collectors’ shelves everywhere. 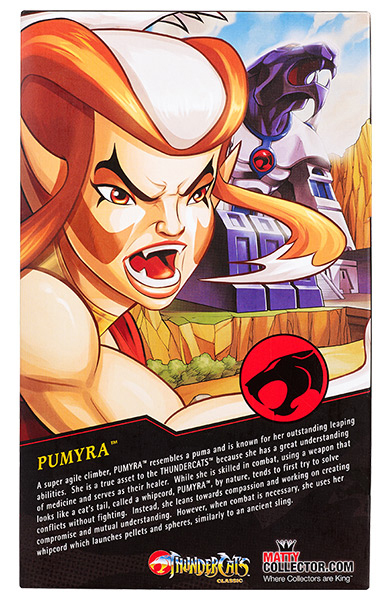 She’s fully articulated and, standing over 6″ tall, Pumyra is every bit as imposing -maybe even a bit more- as she was in the classic cartoon. 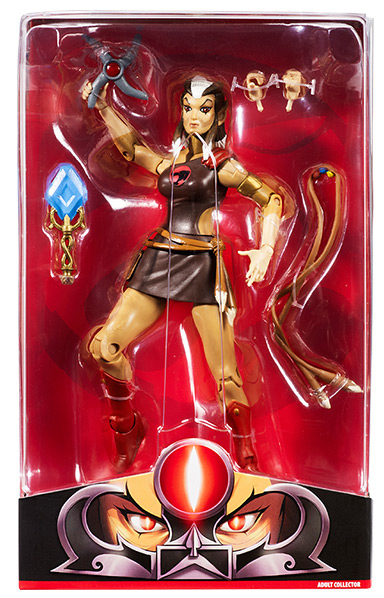 This lovely figure comes with an extra set of hands, two versions of her Cat’s Tail Whipcord Weapon™, Boomerang Weapon, and Totem of Dera. 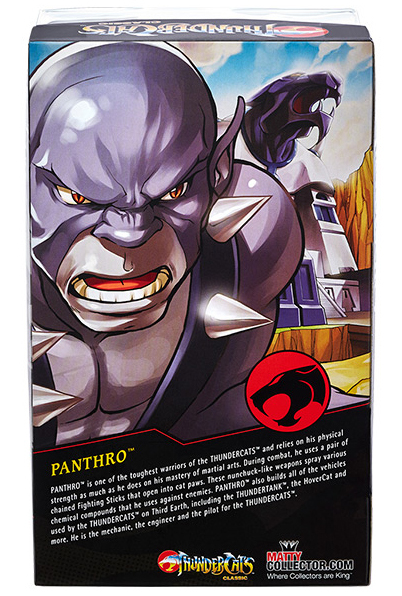 Panthro’s december release was bitter-sweet as he is the last figure of the 2016 subscription and of the ThunderCats Classic line by Mattel. But they went out with a bang! 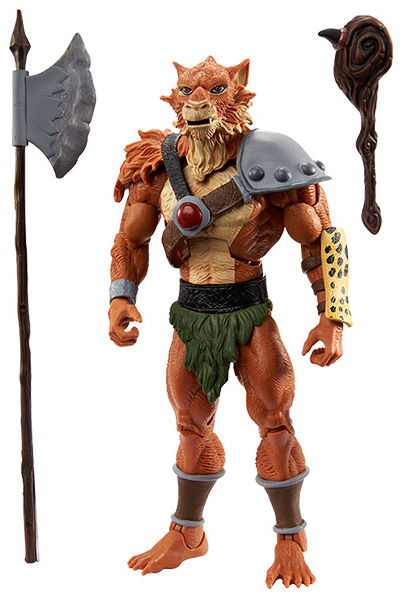 This figure is amazing! 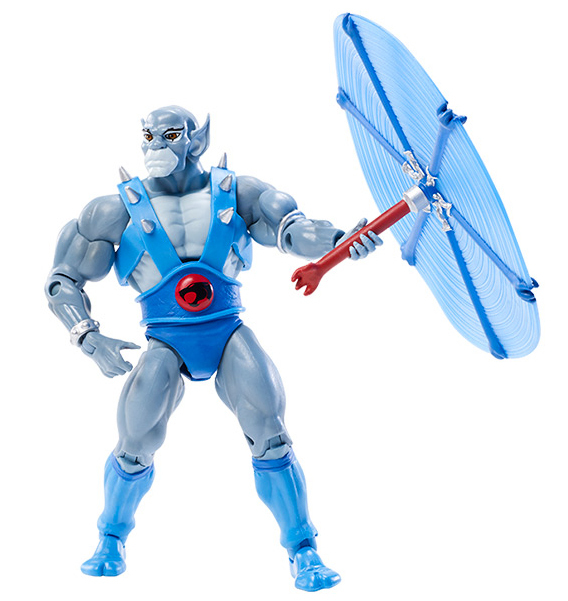 Panthro stands about 6” tall and comes with a nice assortment of accessories; an extra set of hands, his signature nunchucks + a spinning action attachment, his Thundrillium Detector (Thundrometer), and the Key of ThunDera. 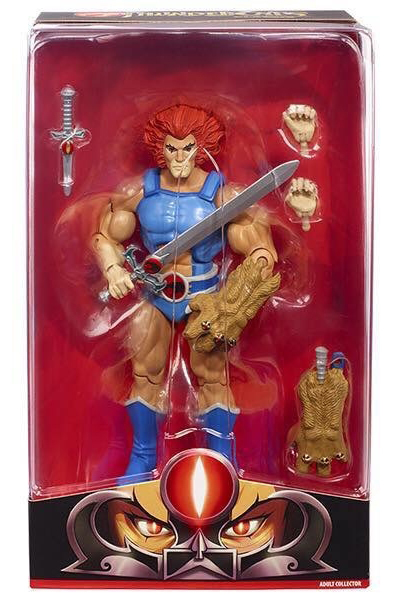 The Lord of the ThunderCats is planned as the first figure. 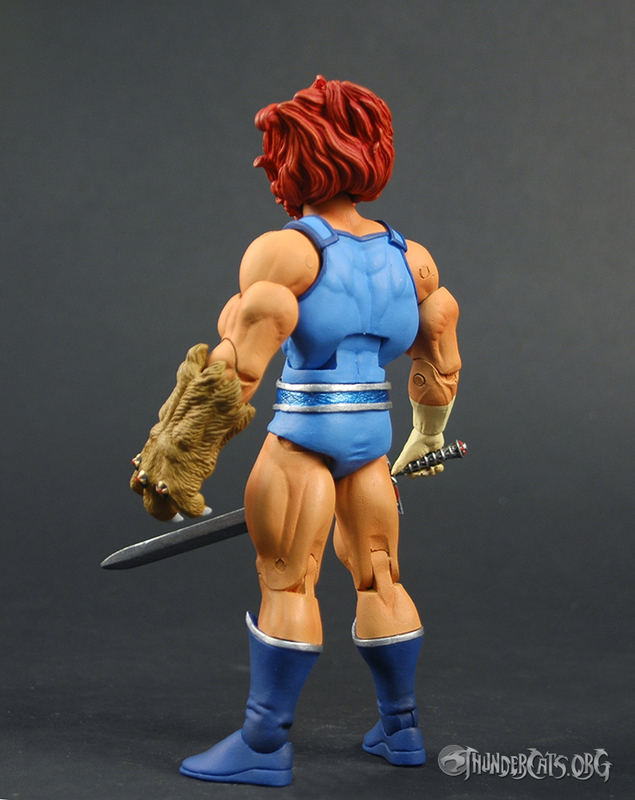 The Four Horsemen sculpted this prototype, as well as a Jackalman figure, as a presentation model.